easy for Owen because it interfered with his swimming. Gillette orthopedic surgeon, Tenner Guillaume, MD, suggested Owen undergo surgery using magnetically driven growing rods known as MAGEC rods. In March 2016, Guillaume implanted two rods in Owen’s back to straighten his spine. Following the surgery, the system uses magnets to lengthen the rods as Owen grows. 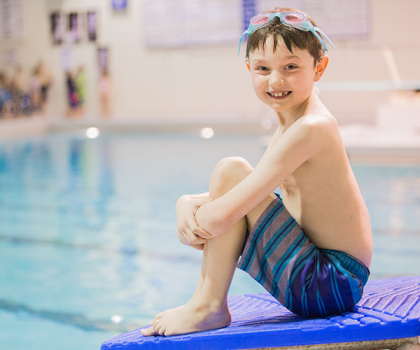 The magnets allow Owen to avoid one of the major drawbacks of a traditional rod system—having surgery every three to six months to adjust the implanted rods. 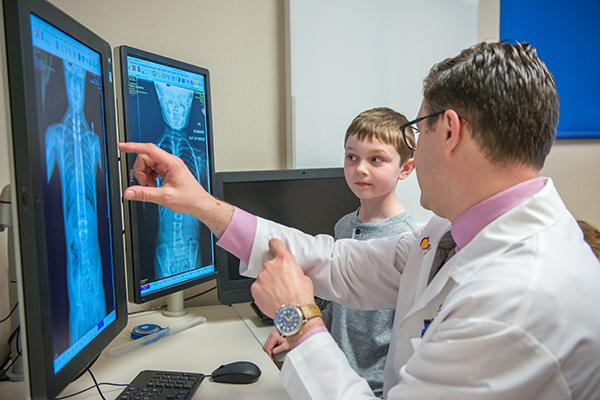 Gillette Children’s Specialty Healthcare is internationally recognized for treating pediatric spine conditions, complex congenital abnormalities, and high-grade spondylolisthesis. Gillette performs 80% of spinal fusion procedures in Minnesota and 65% of spine fusions to correct scoliosis. We also perform 63% of neurosurgery spinal procedures. Our providers were the first in the region to treat early-onset scoliosis with magnetically driven growing rods. Jacob Mitchell and his mom, Mary Franklin, didn’t plan to become Minnesotans when, in 2014, they drove up from Arkansas to visit family friends. 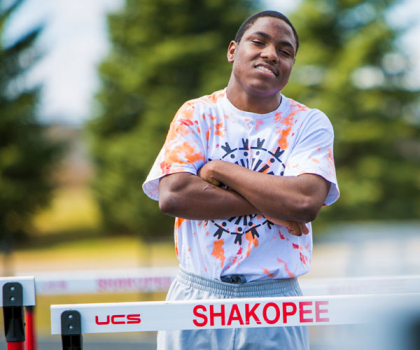 But Mary quickly discovered the Twin Cities held potential—for herself and for Jacob, 18, who has cerebral palsy. Shortly after their move to Minnesota, Jacob’s mom learned about Gillette Children’s Specialty Healthcare and orthopedic surgeon Benjamin Novak, MD (pictured at right with Jacob). Mary admits being skeptical. Surgical interventions throughout Jacob’s childhood hadn’t had the desired effect; he still walked with a crouched gait, his knees flexed at an angle. Jacob’s first appointment with Novak changed Mary’s perspective. “He blew my mind!” she says. “He checked Jacob over from the hips down. He said ‘Jacob, what do you want to do in the future?’” Jacob answered Novak immediately. “I told him I wanted to run track,” he says. “I love running.” Jacob always aspired to run track but wasn’t able to in Arkansas—the physical activity strained his body too much. Novak recommended Jacob undergo two simultaneous procedures—a distal femoral extension osteotomy (DFEO) and patellar tendon advancement (PTA)—to improve his endurance and mobility. Gillette is among the world’s first hospitals to combine the two procedures, and Gillette-led research indicates the interventions can improve patients’ knee extension long-term. The procedures improved Jacob’s couched gait substantially. “I walk better than I used to. I walk straight without slouching and I’m able to lift weights in school,” Jacob says with pride. 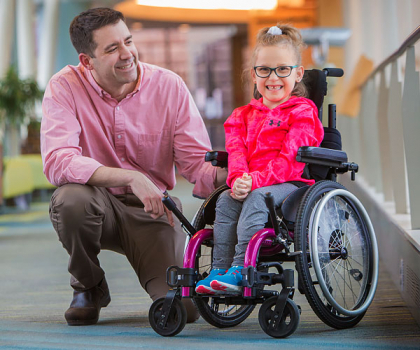 Research conducted at the James R. Gage Center for Gait and Motion Analysis at Gillette Children’s Specialty Healthcare is improving cerebral palsy care worldwide. Gillette-led research found that performing two simultaneous procedures—femoral extension osteotomy (DFEO) and patellar tendon advancement (PTA)—substantially improved patients’ knee extension and decreased their crouch gait. The result? 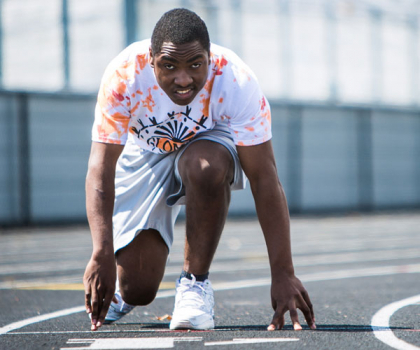 Less pain and improved mobility for patients like Jacob Mitchell. Three studies addressing short-term outcomes, surgical technique optimization, and long term outcomes, are published in the Journal of Bone and Joint Surgery, the world’s most prestigious orthopedic journal. 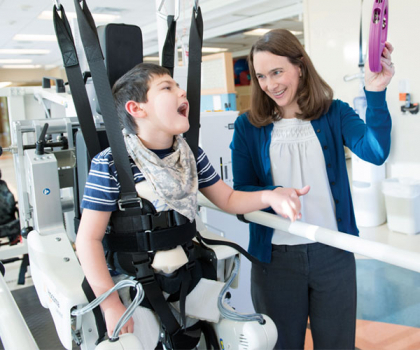 Cerebral palsy centers throughout the U.S. and internationally have since adopted the technique. Hope is special and her dad, Kevin Youngquist, recognized it the instant she was born. She’s the family’s second child but the first to be born with multiple pterygium syndrome—a genetic condition she shares with her dad. 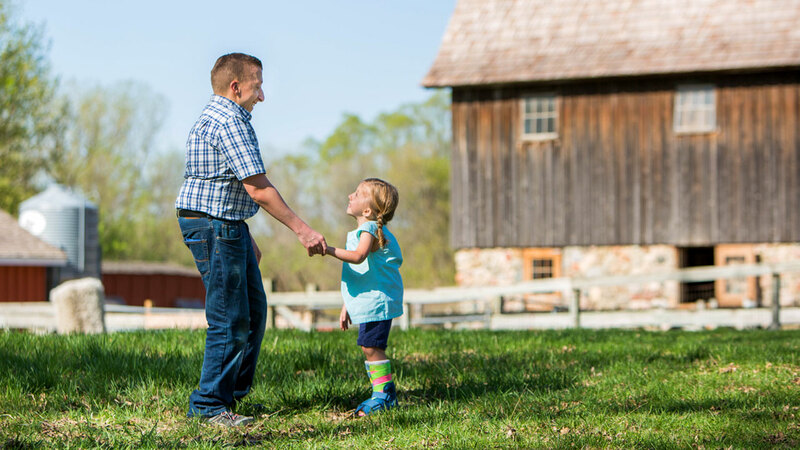 Immediately after Hope’s birth Kevin knew Gillette Children’s Specialty Healthcare would provide his daughter with the expert care she needed—it’s the same hospital he went to as a child. Hope underwent her first surgery at age 4, when Gillette neurosurgeon Peter Kim, MD, untethered her spinal cord. Kevin was reassured to learn Kim is one of the nation’s top physicians for performing the complex surgery. “When Dr. Kim untethered Hope’s spinal cord, it alleviated tension that could have aggravated her scoliosis," Kevin explains. Metal rods in Hope’s spine, which are adjusted as she grows, keep her scoliosis from worsening. Steven Koop, MD, a Gillette orthopedic surgeon, performs her growth rod adjustment surgeries. Hope is far more thana medical condition. She loves animals, wants to become a veterinarian, and often asks her parents to add a dog—a pet Pug—to their busy family. Kevin Youngquist, pictured below as a child, received orthopedic care at Gillette throughout his childhood and teenage years before moving west to attend college in Idaho. He and his wife, MariAnne, moved back to Minnesota before starting their family. The future for Hope is bright and, just like her dad, she has support to achieve her dreams. Six-year-old Kaidyn Micek has proven her mom, Heather Micek, wrong more than once. Take last summer, when she visited the Como Town amusement park with her family. 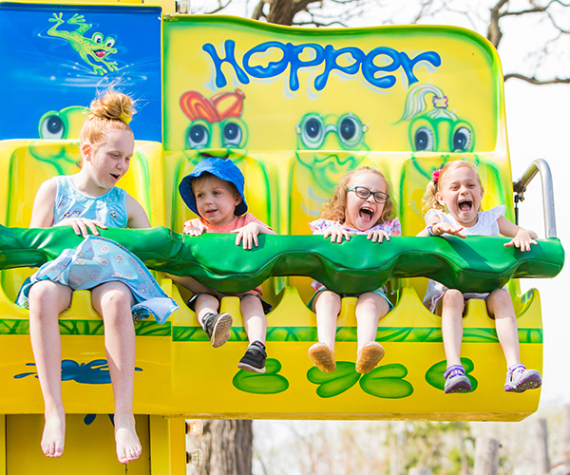 Heather let Kaidyn ride the Frog Hopper for the first time, but worried it might be more than her daughter could handle. As the Frog Hopper started up, Kaidyn’s look of apprehension quickly disappeared, replaced by a wide smile. 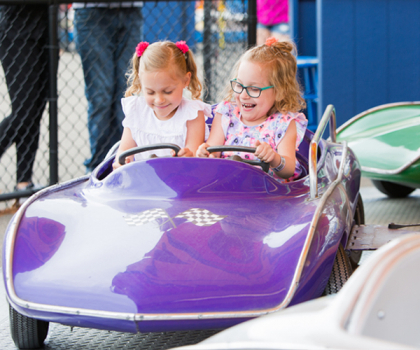 Kaidyn and her twin sister, Keatyn, were born weighing less than two pounds each. In the neonatal intensive care unit, an ultrasound of Kaidyn’s brain revealed that several areas associated with movement had died. She would likely develop cerebral palsy. Tim Feyma, MD, a Gillette Children’s Specialty Healthcare neurologist, shared the devastating news with Kaidyn’s parents. The Miceks followed Feyma to Gillette, where providers closely monitored her development. 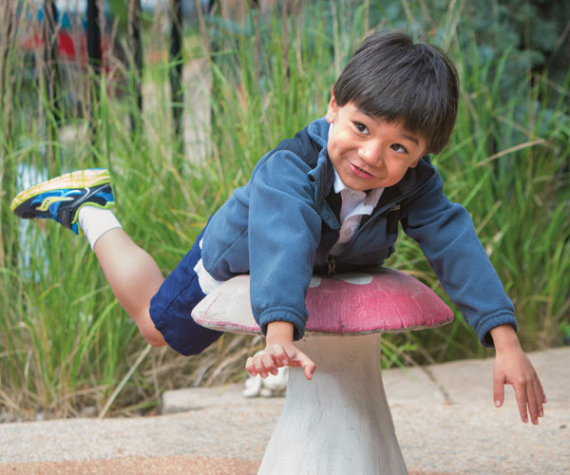 Kaidyn has since undergone two major surgeries to address complications from cerebral palsy. 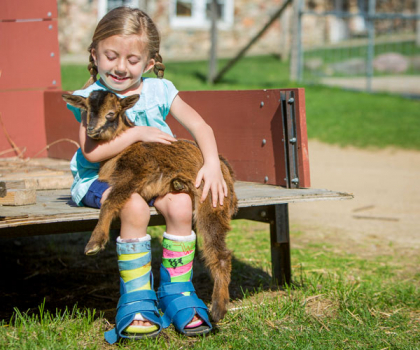 At age 4, a selective dorsal rhizotomy permanently reduced the muscle tightness in her legs. Six months later a single event multilevel surgery, or SEMLS, realigned her hips and femur bones. The two procedures mean Kaidyn, ever the independent child, can learn how to walk. 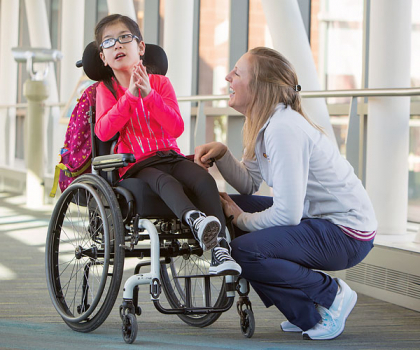 At Gillette Children’s Specialty Healthcare, we’ve built a comprehensive system of care around the complex conditions, like cerebral palsy, in which we specialize. As a result, we can offer children the full spectrum of specialists and treatments they need. 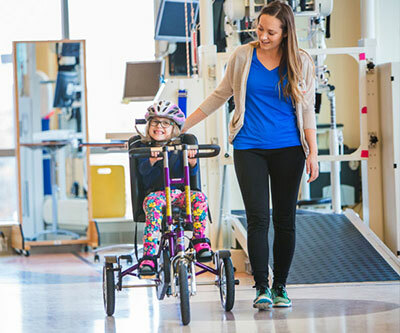 Gillette providers of all levels bring years of training and robust experience to their work with cerebral palsy patients, and conduct research that’s influenced standards of care internationally. Families like Kaidyn’s can feel confident that their child is receiving care from one of the world’s top cerebral palsy centers. Wyatt Lawson doesn’t remember when he started having seizures; he was only 2 years old. His parents, Whitney and Dennis Lawson, recall the time distinctly. “He was slumped over, drooling and unresponsive,” says Whitney. When the same thing happened one month later, Wyatt’s parents sought out Gillette Children’s Specialty Healthcare, a leader in epilepsy care. 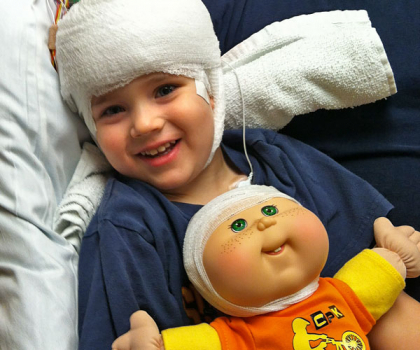 An EEG revealed Wyatt was experiencing multiple seizures, some without visible symptoms. When Wyatt reacted poorly to anti-epilepsy medications, his Gillette team recommended surgically implanting a vagus nerve stimulation (VNS) device. VNS prevents seizures by sending regular, mild pulses of electrical energy to the brain along the vagus nerve in the neck. A stimulation device, located under the skin on the chest, generates the electrical pluses. Neurosurgeon Debbie Song, MD, placed Wyatt’s device when he was 5 years old, making him among the youngest-ever patients to receive VNS. VNS doesn’t affect immediate change; improvements are gradual. 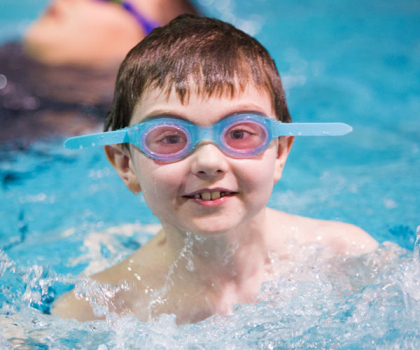 One year after Wyatt’s VNS surgery, his parents describe what they call major improvements. He became alert and active. Cognitively things finally seemed to be clicking; he was no longer in a fog. “His teachers are amazed at how fast his progress is increasing,” marvels Dennis. Wyatt sees Gillette neurologist Nicole Williams Doonan, MD, who makes sure his epilepsy remains under control. He recently marked a year-and-a half with no seizures a milestone he celebrated with cake and balloons. Wyatt Lawson loves cheering on the Minnesota Twins. 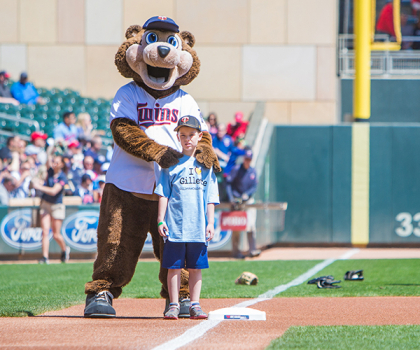 During a recent game at Target Field, he had the opportunity to score the honorary “first run” by racing from third base to home plate with TC Bear, Joe Mauer and the rest of the dugout cheering him on. Gillette Children’s Specialty Healthcare shares Wyatt’s admiration for the Minnesota Twins, as the ball club is a longtime cheerleader for the patients we serve. 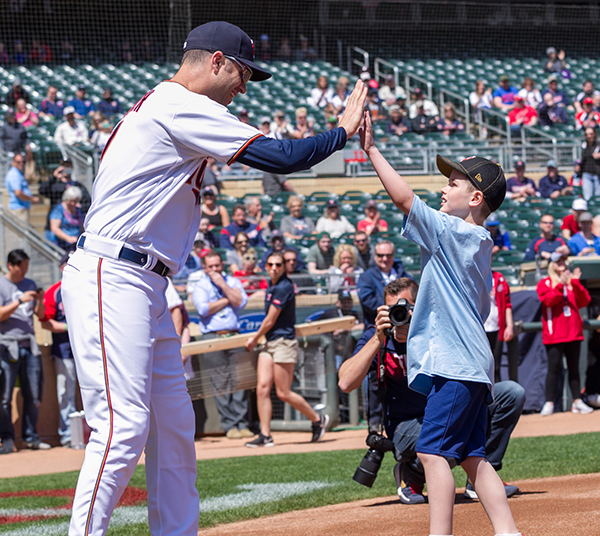 In 2017, Joe and Maddie Mauer hosted the second annual Mauer and Friends Kids Classic. 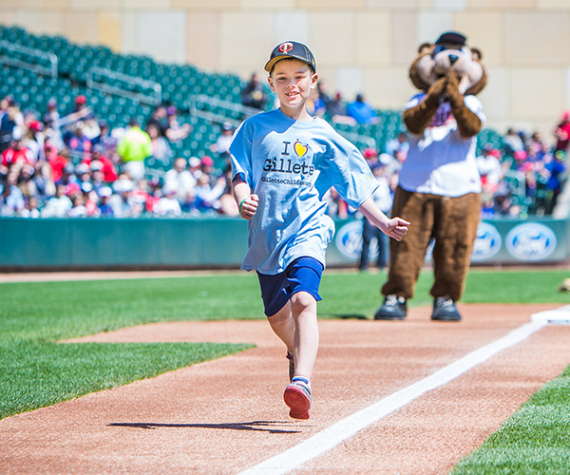 Gillette kids were invited onto the field for sports activities with professional athletes. Corporate sponsors joined the fun from the warning track. A luncheon and Q&A with the athletes followed the on-field fun. All told the event raised nearly $370,000! We’re grateful to Joe and Maddie Mauer, and the Minnesota Twins organization, for their partnership and support. Tyler Ash’s mom, Marilyn Ash, always watched her young son closely for telltale indicators of Duchenne muscular dystrophy. She did this for good reason—her older brother had the condition and passed away at age 35. Marilyn herself is a genetic carrier. Duchenne muscular dystrophy occurs when a gene on the X chromosome mutates, leading to lack of the muscle-protecting protein dystrophin. Without dystrophin, muscles progressively weaken. Current life expectancy is 20-30 years. 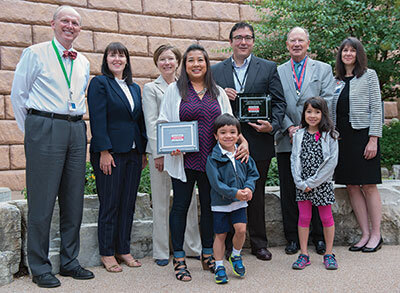 PPMD connected the Ash family to Gillette Children’s Specialty Healthcare, one of only 16 U.S. clinics named a PPMD Certified Duchenne Care Center. The prestigious designation recognizes Gillette’s leadership and expertise in the treatment of Duchenne muscular dystrophy. At Gillette, Tyler is cared for by a highly trained team of neuromuscular experts who work closely with his family to minimize the complications of his condition. “Knowing that Gillette is a PPMD-certified Duchenne Care Center means the world to us because we know for certain Tyler’s getting the specialized care that he needs,” says Marilyn. 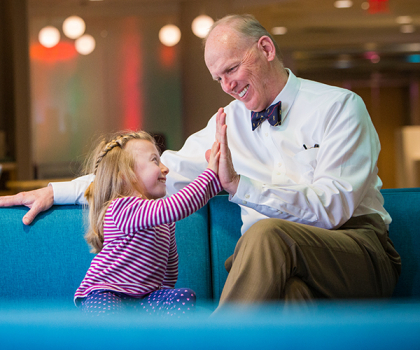 Stephen Smith, MD (second from right) who was instrumental in the development and growth of Gillette Children’s Specialty Healthcare’s neuromuscular program, passed away in early 2018. Smith joined the Gillette neurology department in 1990. He touched the lives of hundreds of Gillette patients and was a true leader in research aimed at finding a cure for Duchenne muscular dystrophy, a genetic neuromuscular disorder that causes progressive muscle loss and weakness. 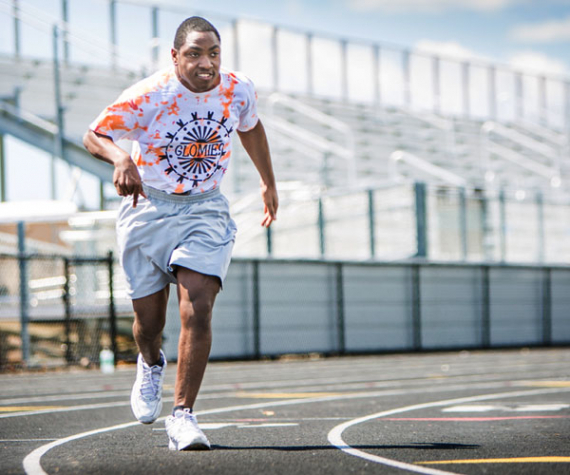 Due to, in part, to his leadership, the Parent Project Muscular Dystrophy (PPMD) named Gillette a Certified Duchenne Care Center in July of 2017. Smith had an easy smile and approached his work with energy and enthusiasm. His focus was always on patient-centered care and he was a mentor to many, including neuromuscular clinic director Randal Richardson, MD. Smith is missed by all who knew him. Our providers continue to deliver on the promise our founder, Arthur Gillette, MD, made to the family of our first patient, Royal Gray, in 1897. Gillette assured the Grays that Royal would receive the best medical care possible. This commitment is part of our foundation and fuels our work today. 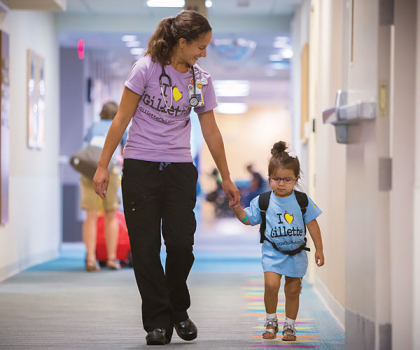 It’s this promise to families that pushes Gillette Children’s Specialty Healthcare providers to pursue excellence and leadership in specialty pediatric care and research. This drives our cultivated expertise that’s recognized around the nation and world. We’ve built a reputation for trust and excellence one patient at a time. 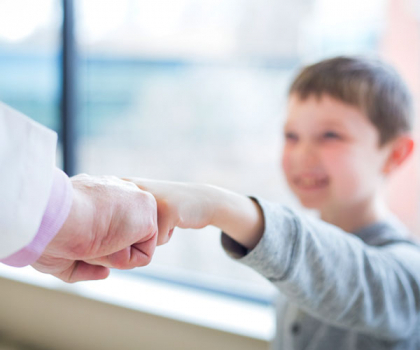 Gillette Children’s Specialty Healthcare is proud of our devoted employees—from our highly skilled and well trained providers to our caring staff who provide an exceptional patient experience to the children and families we serve. Our nearly 1,500 employees are valued and recognized nationally for their patient-focused care. In 2017, the Star Tribune once again named Gillette one of Minnesota’s Top Workplaces. We’re proud to have received this honor every year since 2010. The Minneapolis-St. Paul Business Journal also named Gillette among its Best Places to Work for the third consecutive year. And Becker’s Hospital Review named us among its 150 Top Places to Work in Healthcare in the nation. Gillette employees are committed to the mission and promise of providing outstanding care for our patients. In return, our employees know they’re leaving a lasting legacy that improves the promise of tomorrow. 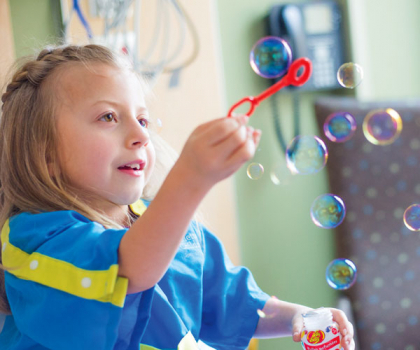 Keeping the promise of CAN wouldn’t be possible Children’s Miracle Network Hospitals partners. 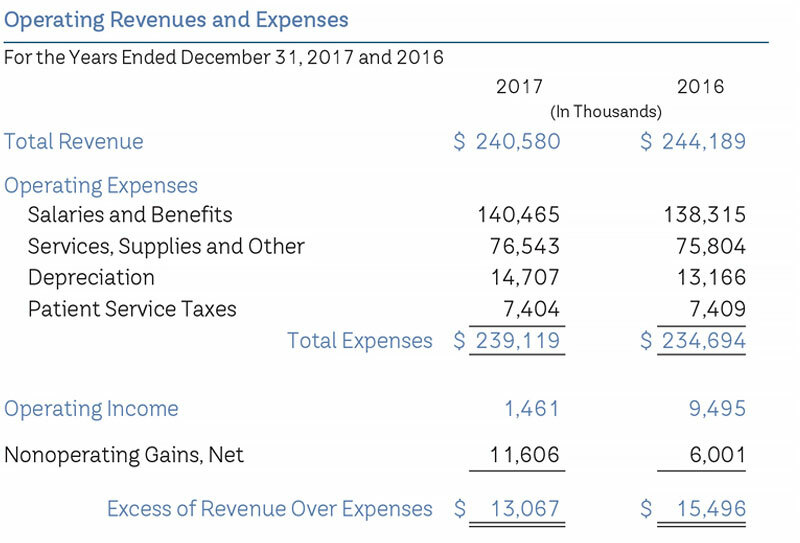 We’re exceedingly grateful to Walmart/Sam’s Club ($697,595); Costco ($296,922); Dairy Queen ($293,554); RE/MAX ($215,277); Credit Unions for Kids ($170,037); Panda Express ($134,773) and Ace Hardware ($117,089) for their support in 2017. 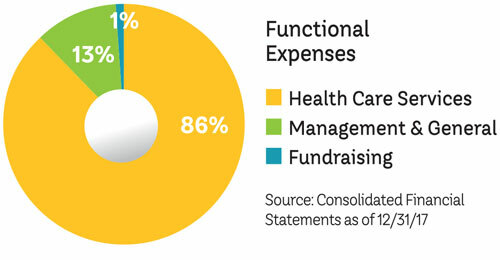 We rely on fundraising support to attract expert providers and deliver a comprehensive system of specialty care to our patients. 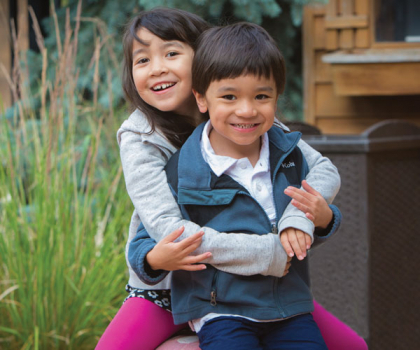 Gillette Children’s Specialty Healthcare is a place where promises are made and kept and lives are changed daily. Families share their hopes and dreams with us and we’re honored by this trust. We’re committed to expanding our reach to serve more families, translate medical breakthroughs in ways that improve care and outcomes for our kids, and invest in training a new generation of providers who will be there to help kids continue to discover what they CAN achieve. 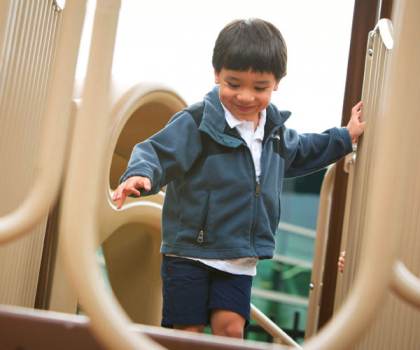 We’re passionate and devoted to caring for kids who have disabilities. Our patients have some of the most complex, rare and traumatic conditions seen in pediatrics today. 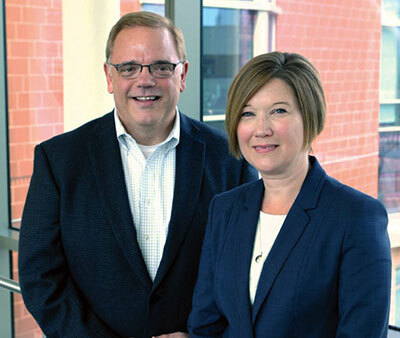 We’ve developed our care model to meet our patients needs by developing a core of focused expertise in our care teams, using our 120-plus years of experience to proactively help our families with care planning, and by delivering compassionate care that builds long-term trusting relationships. 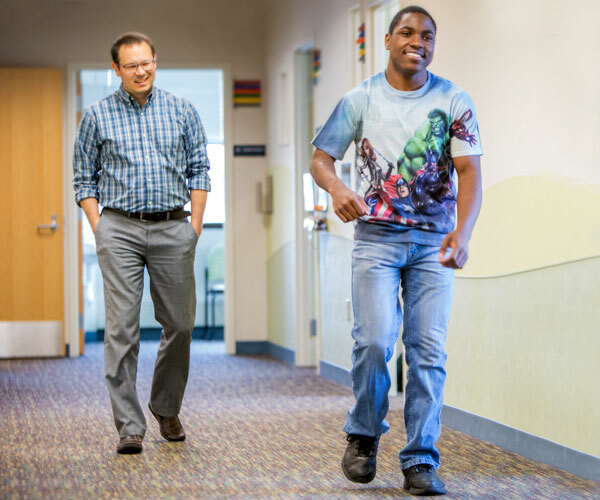 Our pediatric care and expertise receives national and international recognition—particularly in the areas of cerebral palsy, gait and motion analysis, orthopedics, neurology and neurosurgery, and rehabilitation medicine. 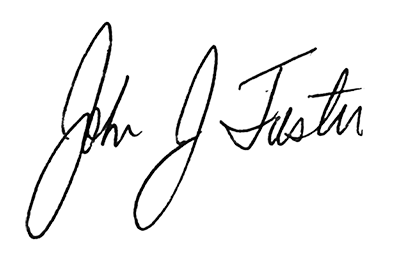 This focus on excellent care and possibilities began in 1897 when our founder, Dr. Arthur Gillette, MD, treated our first patient, 10-year-old Royal Gray from Pine City, Minnesota. Dr. Gillette worked with the Grays to make sure their son had the opportunity to live his best life. It’s the same promise we make to our patients today. I’m inviting you to become part of the Gillette community of parents, providers and donors who want the best for our kids and believe every child deserves care tailored to their needs and the opportunity to succeed. Please consider standing with us by making a gift to Gillette. At Gillette, our mission is strong. Our promises are bold. Our future is bright. Gillette Children's Foundation gratefully acknowledges gifts and pledges made between Jan. 1 and Dec. 31, 2017. View the Donor Honor Roll (PDF). 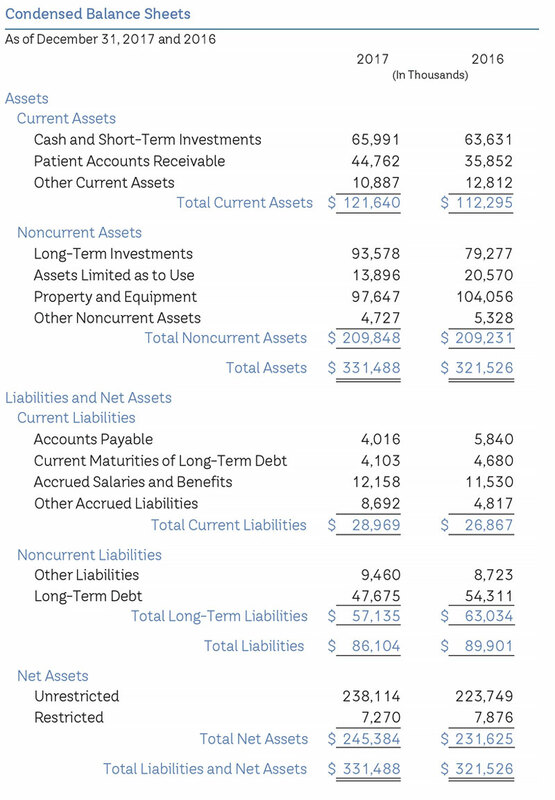 View our Board of Directors and Administration.